The BirdRock Home Door Mat is the perfect addition to your front or back porch. The quality rubber gives you a beautiful design along with a mat that will last. The rubber base gives the mat extra traction keeping it from slipping. 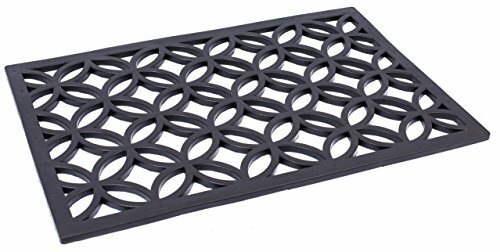 The rubber door mat will help you keep your floors clean by brushing away dirt, mud and snow. A variety of decorative designs allow you to choose the mat that will go best with your home or office. Instructions: clean the mat by vacuuming, shaking or sweeping along with washing with a water hose. Clean Floors: helps wipe away dirt, mud and snow from your shoes keeping your home cleaner. Handwoven, Extra Thick Doormat | Entryway Door mat For Patio, Front Door | Decorative All-Season | Cursive Hello | 24" x 36" x 1.60"